depth of the mould plus the thickness of the guitar back. As the glueing of the back to the sides is quite a "major" operation it will be wise to see that everything needed for the job is at hand before starting it. Your requirments will be: a pot of very hot not-too-thick glue; a small clean glueing brush; a thin steel knife blade (an old table knife will do); two long-tongued G cramps with an opening of 4" or more; and at least two dozen of the prepared clips (men�tioned above) and four dozen of the small wooden wedges. 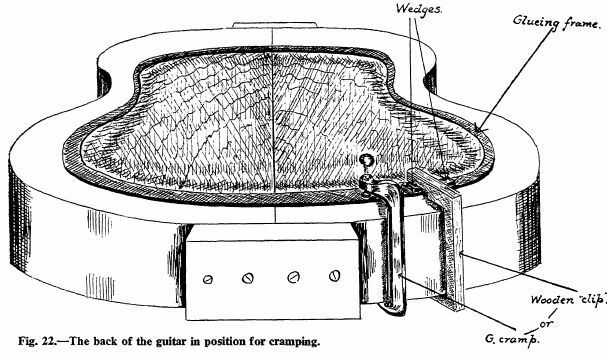 You will also need a "glueing frame" and this is illustrated in Fig. 23. This can be cut from thick cardboard, 3-ply wood or even hardboard. 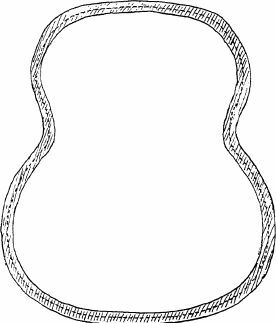 The shape of the guitar is marked on the material (using the guitar mould as a template) and then it is cut to shape by allowing about 1/2"' each side of the outline of the guitar.